I'm pretty sure every Halloween theme post has started with the blogger said 'oh my god I just love Halloween' and I wanted to try and start this one differently, but to be fair, I freaking LOVE it. I love fancy dress like many, so Halloween is the one guaranteed time of year that fancy dress is pretty much mandatory. Like many other years, I always get drawn towards the standard cat, and however boring it may seem, it never fails to be a success! I was asked to take part in Karma Clothing's Halloween Lookbook this year, so wanted to chose an item that would be perfect to style up spookily, but also one I could wear the rest of the year round. I opted for this gorgeous dress as it was the exact balance of fancy dress and normal wear that I was after. The have this style in other colours but I wanted the plain black one as it allowed for much more variety of accessories, events and of course fancy dress ideas! What do you think of my kitten look? And please tell me what you'll be going as this year for Halloween, I'd seriously LOVE to know! That dress is so pretty, and you've done the makeup really well :) I'm going to the masked ball in helston tonight and i'm going as a skeleton! You make such a pretty kitty! 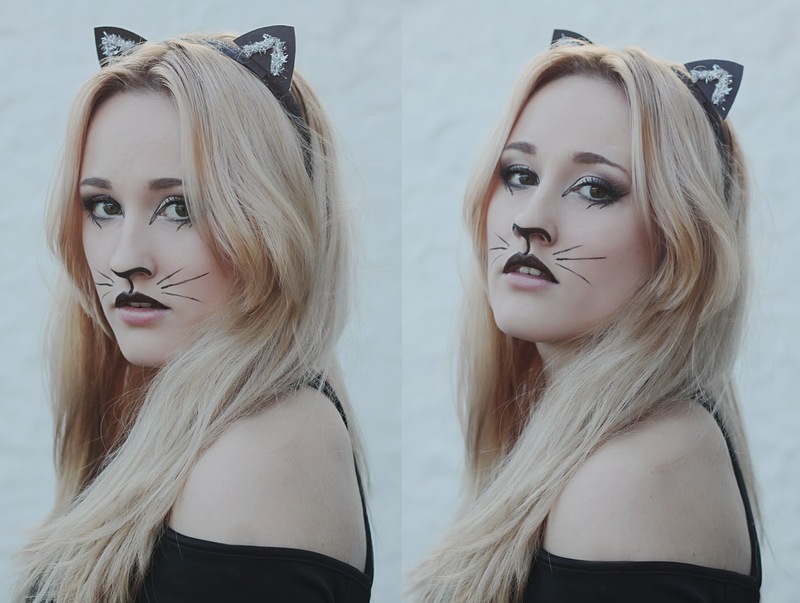 I love this outfit/makeup - perfect for an adult on halloween as it isn't too 'halloweeny' :) Great post. Love this oitfit, and the make up is beautiful! Hi Alex! Love your outfit - I'm dressing up as a cat on Friday so this has given me great make up information! Found you from tonight's #fblchat - I'm now following you! love this - adore the make up! This is so cute! I love how wearing normal clothes and putting a twist on it for halloween it always seems to just work! I love the makeup as well, not just your typical cat!